Tuffy says: Azul Caballos Amigo is SOLD. Here is the kind of colt everyone is trying to track down! BLUE ROAN and perfect. Just a few white hairs try to make a star. Super nice colt, really likes people. His full brother is RNF Blue Valentine, a colt we are keeping as a replacement stud. And this one may be a tad bit better. Both are so nice it is hard to tell! He is 100% stallion quality and has a pedigree to back it. Perfect legs. Perfect disposition. Perfect pedigree. Perfect conformation. 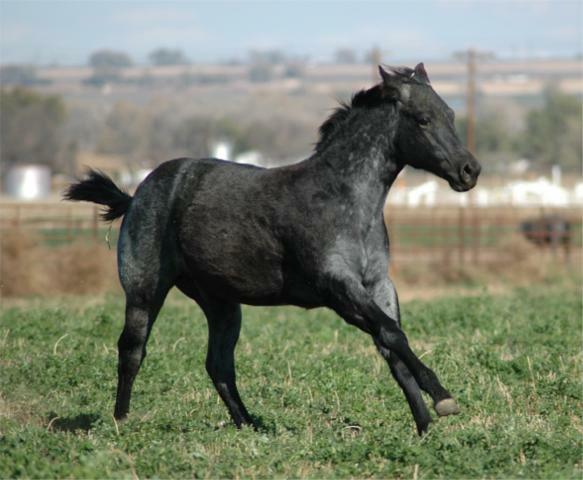 Perfect blue roan. THANK YOU KIMBERLY & ELDEN!!! I HAD NEVER PLANNED ON SELLING THIS COLT. BUT THE RIGHT FRIENDS WANTED HIM AND THINGS JUST WORKED OUT. THANK YOU FOR THE BREEDINGS THAT I WILL RETAIN ON HIM. TAKE GOOD CARE OF MY FAVORITE BOY!! !